In 1988, when chef Nancy Silverton learned the craft of artisan bread-making in anticipation of opening LA's Campanile (still a beloved standard, especially on Thursdays' Grilled Cheese Nights) and the adjoining La Brea Bakery, she probably had no idea that her bread would become a local staple. (She also probably didn't predict that she'd eventually open Mozza,a pizza spot/osteria and one of LA's most competitive reservations–with the best brussel sprouts BTW). At this point, La Brea Bakery loaves can even be found at high-end supermarkets. 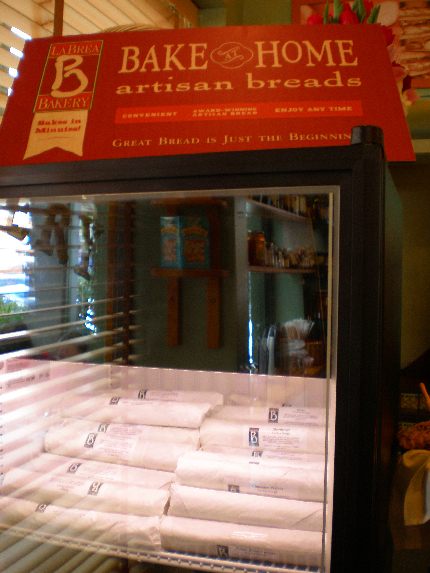 La Brea Bakery remains a destination, though, for delicious breads, sandwiches, pastries and the like. My father, for one, is a total devotee and every time we stop in he tries to cajole me into ordering a ginger cookie or a *canele, so that he can guiltlessly eat dessert too. I'm more of a sucker for the pretzel rolls (as a salt addict and all), but this time around I noticed a fridge filled with cookie dough. Apparently, like some of the loaves of bread, these "Bake Home" cookies are about 80% cooked and then wrapped up, so you can take them home, pop them in the oven and have perfect La Brea Bakery quality cookies ten minutes later. Now that's a baking endeavor that even Andrew and I can competently complete. Hopefully. 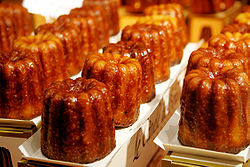 *If you haven't ever had a canele, they're sweet eggy French pastries. I guess, since they're not too sweet and have a great chewy consistency, they're sort of like a more dense dessert version of a popover. And for all you popover fans out there, who haven't found a good one in LA, check out the restaurant in the basement of Neiman Marcus in Beverly Hills. Popover central. I love La Brea Bakery cookie dough- How did you know my baking secret?! How funny! So it’s yummy??? Do you have a favorite kind? ?